Chandra and the Purifying Fire. Chandra was left alone in the dark for much longer than she expected, and left to stew with nothing but her regrets. When the knock at her door finally comes, the end still isn't in sight. Chandra's led down hallways and flights of stairs, and led down further and further underground. 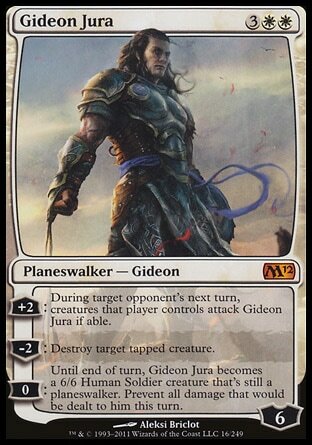 Gideon awaits her at one point, but still they walk on. Through the final narrow stairway, the darkness gives way to the landing that overlooks the chamber of the Purifying Fire. Hundreds of white, crystal-encrusted stalactites hung down from the ceiling. Some were as slender as a wand, others as thick as the trunks of young trees. Some were so long they nearly reached the floor of the cave. Stalagmites rose up from the rough white-marble floor of the cavern, reaching skyward like the spiraling towers of some fabled city. In several instances, they met and embraced the massive icicles of stone that dripped down toward them from the ceiling, twining together like lovers—or like enemies frozen together in the writhing throes of mortal combat. All of the vaguely menacing shapes glowed from within with mystical light, illuminating the cavern so brightly that Chandra found herself squinting. At the very center of this extraordinary underground world was a pure white bonfire rising out of a deep cauldron of jagged white rock that was speckled with thousands of shiny crystal shards. Many members of the Order surrounded it - at least forty of them - dressed in plain tunics and leggings. They encircled the Fire, facing it, with their hands held up, palms turned toward their faces. They were still and silent as they... communed with the Purifying Fire? Drew strength from it? Probably both, Chandra guessed. The silent, white flame of the Purifying Fire burned taller than twice the height of any man and gave off no hint of smoke. Gideon comes to a halt, and they wait for but a moment before Chandra speaks up, not caring if she's interrupting the meditations or prayers of the Keepers or whatever it is they're doing. Chandra just wants this whole thing over and done with. Walbert flinches as she speaks, and gives her a glare which he quickly turns into a smile. He follows that up with a gracious acceptance of her suggestion and says that she's quite welcome to walk into the fire now if she wishes. He tells her that he would prefer to have her enter with as much dignity as possible, but adds that if she refuses to go in on her own, he'll have her thrown in. Chandra sees Gideon's breathing begin to speed up, and as she takes her first step forward he grabs onto her shoulder and tells her to wait. She turns around and the looks he gives her almost destroys her resolve... so she quickly tells him to leave. To stay and watch what happens. Gideon gives her one final nod and heads back up the stairs. Chandra looks at Walbert and tells him she's ready. The Keepers begin chanting, and Walbert gives her a kiss on the forehead so quickly that she doesn't have time to react. All that's left now is for her to walk into the fire. She stretched out a hand and touched the Fire. The flames didn’t burn, of course. Not with heat, not even with cold. They were chilly to the touch, but bearable. And they curled delicately around her wrist and seemed to tug gently, as if encouraging her to enter the silent, shimmering flames and prove herself there. First the magical binding that bound her wrists melted away, then so did the white spell encasing her whole body. The experience was quite the opposite of terrifying. Chandra raises her arms in the air and basks in the flame. All the burdens she's been holding on to for so long are finally giving way to acceptance, and Chandra welcomes to the Fire in the very center of her being to scour its way to the darkest corners of her soul. And just as she accepts the Fire, so to does the Fire accept her, and Chandra finally feels free. There will always be sorrow for what happened to her family and her village, but she knows without a doubt that the nightmare will never haunt her again. Chandra looks at Walbert and the look of victory on his face, and Chandra realizes that he was right. She does have a destiny. 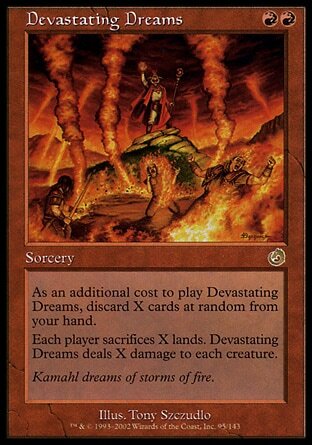 Walbert recognizes what's going on but is powerless to stop her as she draws up the red mana of Regatha and unleashes a golden fire the engulfs the entire cavern. The Keepers scream in pain and she knows only a few will make it to safety. Walbert cries out with disbelief one final time as all his plans fall apart before his eyes. Walbert had gone too far. He had tried to use the Purifying Fire to disrupt the balance on Regatha, to trample on the practices of other mages and other ways of life. 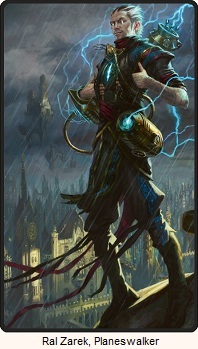 He had disrespected and dismissed the value of all mana except that which empowered him. And now the white mana flow that ran deep beneath the plains of Regatha had embraced and then freed the fire-wielding planeswalker whom Walbert had brought into these ancient caverns to become the key to his conquest. A madness consumes Walbert, one she did not expect, and she staggers backward from his assault. The entire chamber begins to fall apart and white fire that accepts Chandra for who and what she is gives no such protection to the High Priest Walbert, and Walbert goes up in flames. Chandra hears Gideon calling to her and she realizes she was knocked out from a falling piece of the cavern. Knocked out just after she finished watching Walbert die. When Gideon asks her what happened, she tells him as much, but that's not what he's asking. "No, I meant..." He leaned down, seized her shoulders, hauled her roughly to her feet, and gave her a hard shake. Her neck snapped back and her aching head protested as he shouted into her face, "What did you do?" She tells him straight out that it was a "boom" spell. Gideon verbally lashes out at her and cries out with the sound of the betrayed in his voice. He didn't tell her how she could survive so she could do this. Not to the Temple, and not to the Order. Chandra doesn't particularly much care about his concerns. The Order deserved everything they just got. Perhaps next time they won't try to reach beyond their grasp. When Gideon says again that he shouldn't have helped her, she asks him why he did it then. Gideon remains silent for a moment, and then tells her that he helped because he experienced what was going to happen to her when they were on Diraden. What it would be like to be stripped of their power and the ability to move from plane to plane. Because he saw what was happening to her and he couldn't stand the thought of such a final and permanent torture like that. Gideon tells her that she should leave. Leave Regatha. He wants no more death this night and is sure he can convince everyone that she died in this final display of power. 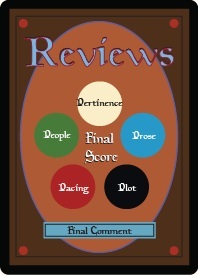 Chandra realizes that maybe he's right, that maybe it's best the Order doesn't know she lives. Perhaps the monastery will be saved from any calls for vengeance against her home if they think she no longer lives. Chandra knows exactly where she'll go next, and Gideon tells her that she's a fool. She'll never find the great power hidden on the elusive plane of Zendikar. But before she leaves, Chandra has a few parting words for the heiromancer. She first tells him that soldiers who executed her village served an order of mages that had quite a familiar sounding justification to their actions. An order of mages that vowed to bring harmony, protection, and law to the land. She tells him that anyone who follows those beliefs is her enemy. From now on it would be best if he never gets in her way. Gideon calls out to her as she walks away from him and he tells her that they'll meet again. She's not sure if it is meant as a threat or a promise, but she doesn't care. A true balance is restored to Regatha once more, and while there will no doubt be skirmishes between the fire mages of the mountain, the heiromancers of the city, and the green mages of the woodlands, there will be no one group that dominates over the other in her lifetime. Now, as she sat down on the charred stone floor of the chamber of the Purifying Fire, Chandra turned her thoughts to the future. She closed her eyes, concentrating on her breathing as she prepared to planeswalk, and she imagined the rich and mysterious plane of Zendikar... which in her heart, she knew must surely exist somewhere in the vast and wondrous Multiverse. I know Chandra was just waking up from being unconscious, but it seems implausible to me that Chandra wouldn't be able to recognize the tone and meaning in his words when he asked her, or rather demanded to know from her, what it was that she did. Using a play on words can be fun, but mistaking an enraged, "What did you do?!?!" for a concerned, "What did you do?" doesn't work for me. And that's the intro to the final section of the book, which gives me the wrong taste in my mouth, which only serves to lessen the impact of Chandra's revelation that it was the Order on her home plane that executed her family and her whole village. It lessons the impact of the their final good-bye. It was rather anti-climatic. It was a foregone conclusion from the very moment that the Purifying Fire was explained that Chandra would be entering it... somehow... and would not die from it. With that in mind, the ending can still work if done right... but while we've seen Chandra having dreams that haunt her, I never felt as if what happened was her fault. It doesn't seem that hard to accept what happened... because it was always the soldiers' fault. Sure she practiced her magic against the will of the elders, but they were really only against it because of the new laws set in place by the Order. So when Chandra parades it around as great triumph, that if she can do it she's better than Walbert because the Fire didn't accept him... well... he actually has a lot more to accept and to face because his past actions are quite a challenge to overcome. It's like an adult being proud they beat a tiny kid in a race. Yeah the adult won... but that's because he has significantly longer legs than the kid, so doesn't have have to try as hard to get to the finish. Oh, and I should talk about that final fight. Walbert screamed as the fire that engulfed the two of them consumed him. He tried to fight it off with his power, but Chandra could see that none came to him now when he called on it. The white mana that had spared her had also, it seemed, abandoned the high priest of the Temple. Chandra watched dispassionately as Walbert died like any common man. Let me type that out again. He tried to fight it off with his power. I really wish I knew what that power was. The final fight ended so abruptly that there is esentially no pay off. 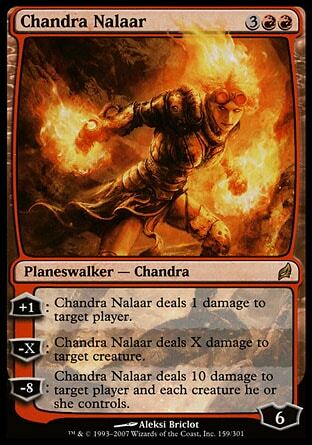 We get one line that Walbert is quicker than Chandra expected, and then read that the Purifying Fire strips Walbert of his so called power so he doesn't have the ability to defend himself, yet we never learn what it is he would have done had he still had his powers so it makes it really hard to gauge how impressive that is, or how fortunate Chandra is that she beat him through the purity of her soul rather than needed to rely on her fire magic. It's just unsatisfying. And that's a shame. 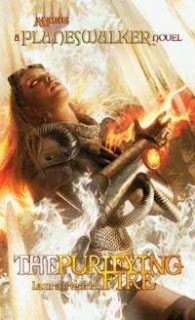 While the story about the scroll served to force Chandra and Gideon to meet, and helped to provide Gideon a reason why he would try to save her from a "fate worse than death," the two stories felt rather completely independent from each other. I tend to want a bit more cohesion in my stories. Read Through complete! This wasn't a terrible book, but it certainly has some issues.